* = Jim Devereaux has been known as ‘JD King’ since September 2015. Where asterisked Jim’s previous show name ‘This Is Elvis’ was used in the original review. We both just want to say a huge thank you for making our wedding day so absolutely amazing. Everyone loved you, and the feedback that we had from all of the guests was that you completely stole the show. We remain your number one fans and will always sing your praises to anyone who will listen. I just wanted to thank you again for a fantastic show last night. Everyone really enjoyed it. Many thanks Jim you made the day. You were top of all conversations on how good you were. The show was great. We would both like to say thank you so much for making our wedding day so special! 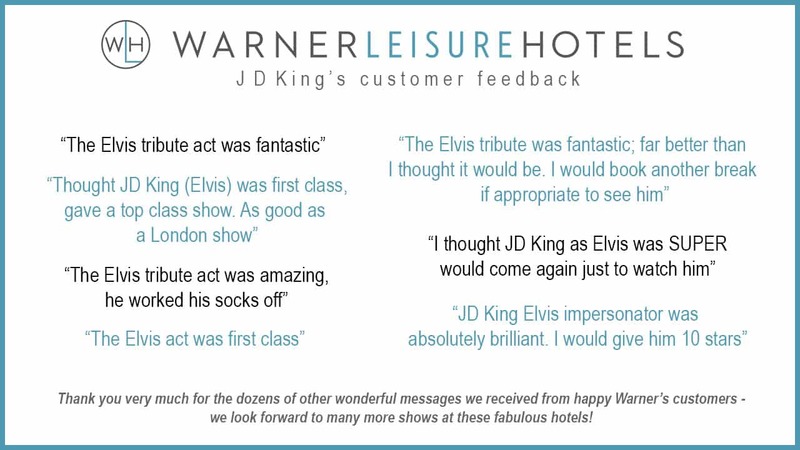 The feedback from the guests was great with many saying it had been the best wedding they had been to and that you were one of the best Elvis’s they had seen. Thank you so much for making our anniversary party such a HUGE success. You were TRULY fantastic. Locals thought you were performing at Reading Rock Festival. Cant recommend STRONGLY enough. Elvis aka J.D. King put on a fantastic show and guests were raving about him saying he sounded like the “Real Thing”. He may like to know that neighbours thought they could hear him performing at Reading Rock Festival. He certainly has a GREAT talent and future ahead of him. Had the distinct pleasure of working with Jim when he did a show for our company at the Ritz London. He was tremendous! Jim really brought that unique “Elvis” vibe to our event. The song selection was great, as was the entire band, the energy and the performance. HIGHLY recommended! 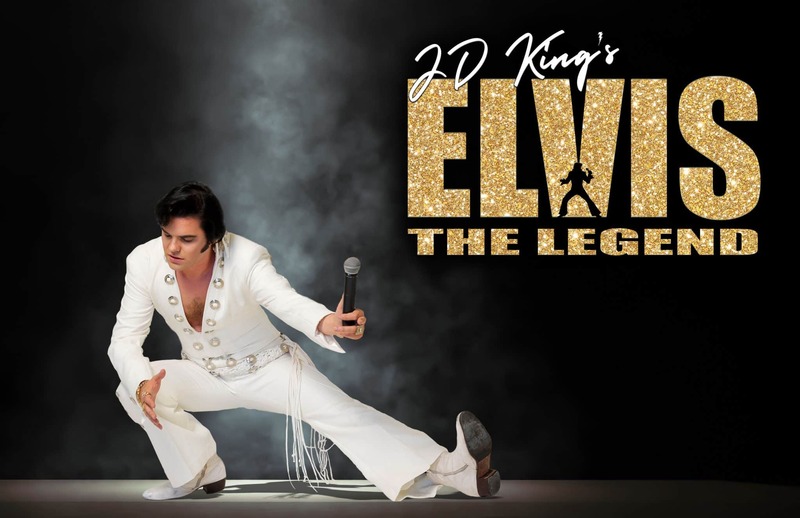 My daughter and son in law booked JD King Elvis for their wedding August 12th. It was an inspired decision as JD was amazing. He had the whole party dancing from the off. His voice is amazing – just like Elvis and his outfit was amazing too. Please pass on our thanks to him and thank him for setting the standard for the evening wedding celebration. We will definitely be recommending him to others. J.D was absolutely AMAZING, surpassed all my expectations. He made our wedding day so so special and we can’t say thank you enough. He was so nice and professional, has a wonderful confidence, perfect voice and beautiful jumpsuits. We didn’t want him to leave! What an absolute legend JD is. He is easy to be around, polite, lovely and as for his act, well he absolutely brought the house down! Everyone joined in and he made our night. 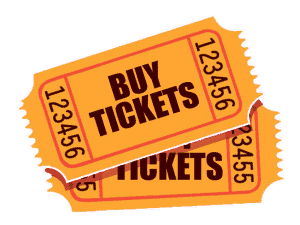 It would be nice to know whenever he is playing a ticketed venue as we could maybe go and see him again. I just wanted to say on behalf of Henley Rugby Club how brilliant JD was. An absolute professional and great guy- probably the best Elvis tribute I’ve seen. Everyone thoroughly enjoyed themselves – he engaged with the audience and didn’t disappoint. We look forward to welcoming him back to Henley in the not too distant future.